Petrozavodsk, the capital of Russian Karelia, is situated at the cost of a large and beautiful Onego Lake, 400 km to the North-East from Saint-Petersburg. 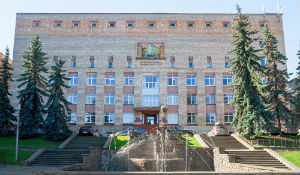 The town is the largest University and cultural centre in the North-West Russia. For more information about the city and its places of interest, please, visit here. The work of the conference will be organized in the building of the Karelian Research Centre of the Russian Academy of Sciences (Pushkinskaya st., 11). The location of conference halls in the building of the Karelian Research Centre will be marked by special signs. If you plan to participate in an excursion, please, write it down in a corresponding field of the registration form (a list of available excursions). Touring groups are to be formed before May 10. Payments for tours are to be paid at the registration desk on May 23 from 8 a.m. in the building of the Karelian research centre (Pushkinskaja st., 11). ATTENTION!!! Abstract submission is extended to April 15, 2019! Official conference languages are Russian and English. Selected papers are planned to be published in journals “Mathematical game theory and its applications” (indexed in Web of Science Core Collection) and “Transactions of Karelian Research Centre of RAS”. ATTENTION! If you submit an article to the journal “Transactions of Karelian Research Centre of RAS” before April, 25, it may be published in July of 2019. Instructions for authors. Karelika Travel Company is a partner of the Conference. Mail address: Russia, Karelia, 185030, Petrozavodsk, Lososinskaya nab. 7, office 1. Phone/fax (8142)571089; phone/fax (8142)571671; phone/fax (8142)784451. “Karelika” organizes excursions and other social events and helps in accepting conference fee payments. Early registration fee for a foreign participant (or his/her accompanying person) is EUR 100 (payment before April 15). Normal registration fee is EUR 120 (payment after April 15). The registration fee covers conference attendance and materials, a book of abstracts, visa invitation and support, welcome party, coffee breaks. Payments for excursion and seminar dinner should be made at the registration desk upon arrival. Address of the bank: Kirov street 10, Petrozavodsk, 185035, Russia. ATTENTION! In payment purpose it is necessary to specify: Registration fee for PMDM2019 participant Ivanov I.I. Please do not forget to inform the organizing committee about your payment by the e-mail letter to pmdm2019@krc.karelia.ru with attached receipt. Participants from Russian Federation and Belarus should follow the registration rules, given at the Russian version of this page. Foreign participants who need visa should contact the local organizing committee no later than March 1, 2019. Information on Russian visa requirements can be found at VisaToRussia and Russian Embassy. The list of countries whose citizens have visa-free entry to Russia (from 30 to 90 days): Argentina, Armenia, Azerbaijan, Belarus (unlimited stay), Bolivia, Bosnia and Herzegovina, Brazil, Brunei Darussalam, Chile, Columbia, Costa Rica, Cuba, Fiji, Guatemala, Guyana, Honduras, Israel, Kazakhstan, Korea, Kyrgyzstan, Macedonia, Moldova, Mongolia, Montenegro, Nicaragua, Peru, Serbia, South Africa, Tajikistan, Thailand, Ukraine, Uruguay, Uzbekistan, Venezuela (see the list here). Below is given a list of hotels located within a walking distance from the building of the Karelian Research Centre. The size of the discount for participants of the conference is indicated in brackets. Hotel “Fregat”****, Karl Marks av., 1А (no less than 20% discount; promocode for the booking: PMDM2019; the discount is valid both for booking through the online form on https://frigatehotel.ru/ and booking through the e-mail: hotel@fregatfamily.com), 10 min walk to the venue. Hotel “Cosmos Petrozavodsk”****, Kuibishev st., 26 (15% discount; promocode “science” both for online booking and booking by phone), 10 min walk to the venue. Hotel “Piter Inn”, Gagarin sq., 1, next to the railway station (10% discount; booking through e-mail reserv@piterinn.ru or by phone 8(8142)717071, promocode “mathematics”), 30 min walk to the venue or 5-10 min by local buses. Hotel “Sakvojazh”, Sverdlov st., 10 (5% discount), 5 min walk to the venue. Hotel “Severnaja”***, Lenin av., 21 (20% discount), 20 min walk to the venue. While booking in the hotels “Sakvojazh” и “Severnaja” to get a discount you have to tell that you are a guest of the Karelian Research Centre and a participant of PMDM2019. In all of these hotels breakfast (buffet) is included. All the hotels (exept “Sakvojazh”) have restaurants. There are a lot more other hotels in the city including low budget ones. Hotel “Prionezhski” (Fedosova st., 46), 15-20 min walk to the venue. Hotel “Masks” (Karl Marks av., 3А), 5 min to the venue. You can also use hotel and apartment booking services such as Booking or Airbnb. Cultural affairs include welcome reception, conference dinner and excursion. For more detailed information about cultural and social life of the city, please, visit Petrozavodsk Tourist Information Centre. – Abstract submission: before April 15, 2019!!! International tourist routes Blue Highway and “Kola” go through Petrozavodsk. The city is served by the Petrozavodsk Airport “Besovets”, and a train station on the Murmansk Railway with train connections to the main centers of Russia. More detailed information on the city transportation see on Petrozavodsk transport. If you have any questions, please, contact pmdm2019@krc.karelia.ru.